– Rankings: I know these are quite subjective and don’t have all that much meaning to me, but there were a couple sections I wanted to change. I did one major change back in 2007 and had to re-rank everything, so I’ll be doing the same here. Also, now that I’ve seen many venues in multiple sports it helps to give a perspective when being able to compare a lot of facilities. 1) Made the Exterior worth 10 points instead of 14. When I first started doing these trips, I valued building architecture a little too much. I didn’t de-value the inside (14pts) because that I feel is the most important part of a stadium. Though first impressions are big, I think a bigger part of the stadium experience instead of the exterior is……. 2) Made the Atmosphere worth 14 points instead of 10. The atmosphere many times makes or breaks a stadium. Tullio Arena may be a dump, but I want to go back because of that atmosphere. I considered giving some points to fan support as the two can go hand in hand, but I felt that atmosphere is a much better gauge. 4) Changed the “Game” ranking to “Prestige”. I used a quality of the game ranking because I did this on a personal level for so many years. I always knew it was silly and irrelevant when judging the quality of the stadium experience, so I finally came up with a replacement. There was nowhere in the rankings that really gave credit to a historical venue. So I combined that, along with asking straight out “Do I want to come back?” for a “Prestige” category worth 5 points. – More Detailed Reviews: Starting with Citi Field, I went with a more detailed review, breaking down additional parts of the stadium trip. This became more time-consuming on my end, but I enjoyed giving a thorough overview of the whole stadium experience. So, I’ll be going back to do that with the previous 80+ reviews. This will be easier in the later years when I wrote more, but likely will become a struggle when I get to those first 30 venues or so, when I never really focused on things like cost, concourses and food. Obviously this will take a while, but I’m looking forward to going back as it will become well worth it. It also helps for consistency sake, which means I’ll also be fixing that top header to get rid of the game attendance, which I explained that sham here back in August. – Saying Goodbye to 3 Venues: I want to do this right and I think its time to say goodbye to three venues that I didn’t truly visit. The 21st visited stadium was Doubleday Field in Cooperstown. I was there to visit the Hall of Fame and while there, I went in to take a look at the stadium while an adult amateur league was going on. It of course was no game and I shouldn’t have counted it (shame on me). They will be removed from the Visits list. Luckily the Hawkeyes from the PGCBL now play there, so there’s still a chance to go have a real visit. The other two venues I removed were a couple places right next to each other in Lake Buena Vista, FL. 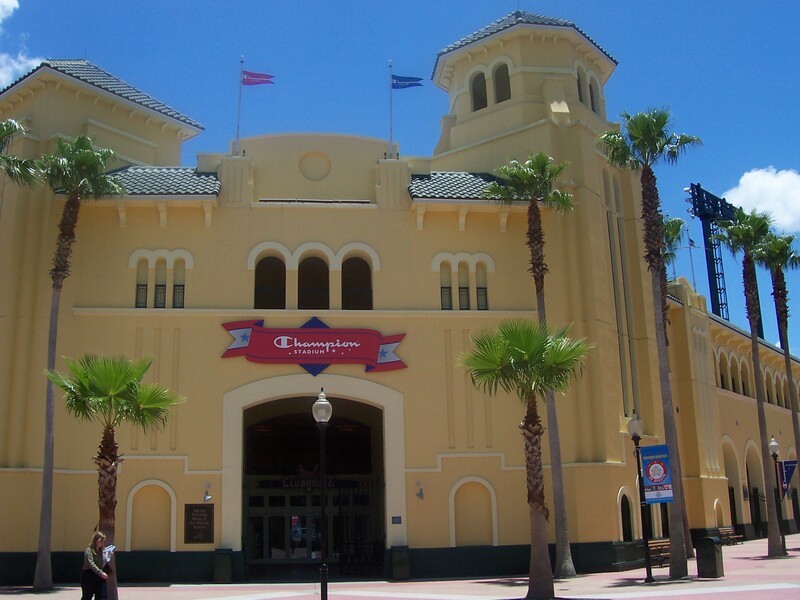 While the MLB draft was going in the DisneyWorld complex, I saw Champion Stadium and HP Field House (formerly the Milk House). This was on my honeymoon and I have quite a loving wife who gave me an hour to see these two facilities. Now, obviously I didn’t see a game here and technically it is not a visit. Not sure why I included these three in the first place, maybe because I wanted to grow the number of stadiums seen? Regardless, I removed the visits and reviews from the website. This of course, screws up the number for each venue (ie. #91 Rentschler Field will now be #88 Rentschler Field), so that will take some cleaning up. It also means that the special #100 visit (Rhode Island’s Ryan Center) was actually #97. But I don’t care one bit, because in my eyes that is always #100. – More Pictures: OK, this post is starting to look like the back of a video game, which was not my initial intention. Anyway, each visit I usually take a couple dozen pictures, but I’ve only posted a few on the website, not knowing how much download space I have. Seeing as though I have a decent amount, I’ll be adding some to each review with the goal being 1 exterior shot, 1 concourse (absent in the earlier years), and 4 or 5 interior shots. The last picture is something I just completed and that is an image of the program and ticket stub, of which I collect from each game.